by Didi Cheeka Where does history begin? And when is memory born? Memory, all too often, is born with that event in people’s lives that serves as a watershed by which all other events are measured. And then people acquire new identities: victims, survivors, perpetrators. 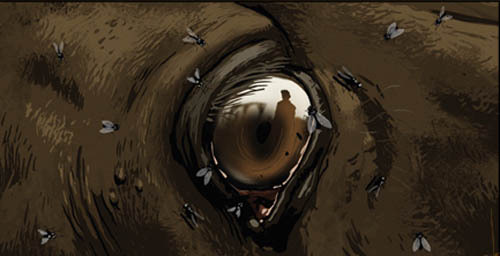 History, memory, identity; these are themes explored by Ari Folman in his film Waltz with Bashir. For Ari, history, memory, and identity are inextricably interwoven with Lebanon, before the birth of history and memory. And before his change of identity. Before Lebanon, he was just another soldier in the Israeli army. After Lebanon, he became a killer; a memory keeper. Early one morning, in the summer of “82 Israeli F-16s screamed over the rooftops of Beirut. The planes, a gift from the US, left death and destruction in their wake. The goal, it was said, was to protect Israel’s borders from Arafat’s Fatah fighters. The target: Sabra and Shatila–two refugee camps side-by-side ran by the United Nations–into which thousands of Palestinians were crowded. For two months the Israeli military bombed Beirut. For two months there were death and burials. To end the deaths Arafat and the PLO agreed to leave Lebanon for Tunis. The peace deal, brokered by the US, assured the Palestinians peace on condition that they renounced violence. But for Ariel Sharon and the Israeli military, it was one last chance to kill more Palestinian fighters before they fled into exile. So Sharon urged the Palestinian fighters still in Sabra and Shatila to remain. But the bombings had triggered international outrage and dented Israel’s image. So they handed this murderous task to the murderous Christian militia, the Phalange. Before then the civil war had broken out between the Christians and Muslims in Lebanon. The murderous militia had surrounded another Palestinian refugee camp Tel Zaatar, and for sixteen days rained down rockets and death, before bursting into the camp in a slaughtering frenzy. And now Sharon’s army had surrounded the refugee camps of Sabra and Shatila and allied themselves with the Phalange, whose leader, Bashir Gemayel had just been murdered in his headquarters in Beirut. On the night of September 16, the Phalange streamed into the camps to execute Sharon’s dirty job. In Richard North Patterson’s Exile, a novel on the Israeli/Palestinian tragedy, the author had an Israeli character say of the Phalange: “they would kiss your wife’s hand, and then cut her throat. And they were inflamed by the murder of their leader, Gemayel…. To this day I don’t know whether Sharon and the others were certain what would happen. But for my part, I warned my superiors that these murderers would slaughter Palestinians without discrimination. They did not listen.” The Phalange streamed into Sabra and Shatila armed with machetes, rifles, and submachine guns, going from house to house. Watching from the surrounding rooftops, Sharon’s soldiers fired bright orange flares to light the camp. Ari Folman was one of those detailed to guard the outer ring of the camps while the militiamen committed mass murder within. “When it was done,” the same character continued, in North’s Exile. “I entered the camp. And I found children who had been scalped, men who had been castrated, and women who had been raped before their throats were slit. Among the survivors were children with arms or legs gone, others with their minds gone.” Folman could well have written these lines, for they were the terrible secrets of his lost memory. Secrets he had chosen to forget. And forget he did. Or so he thought. Until a chance encounter, in 2003, with a psychiatrist cracked the wall of his memory. He had left the Israeli army after his three-year stint and broken all contacts with the men in his platoon. “I didn’t call them,” he said. “I ignored their reunions.” That way he thought he could live his life without dealing with his war memories. 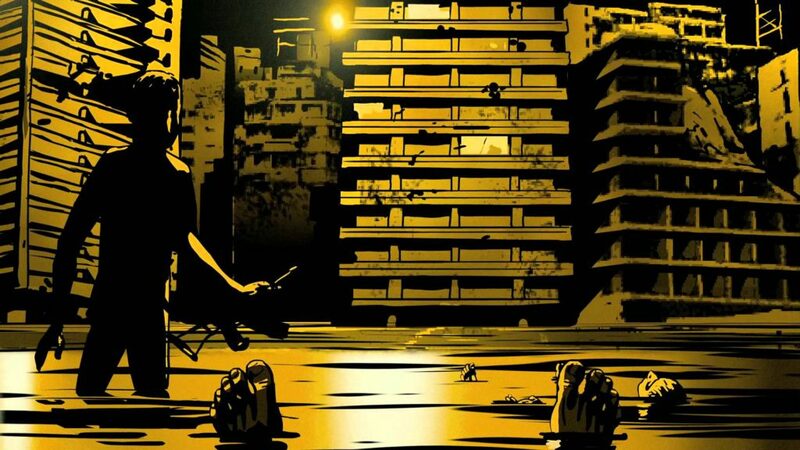 Waltz with Bashir is a feature-length documentary-memoir that details Folman’s journey into himself, into his past to retrieve the ‘lost’ memory of his time with the Israeli army at Sabra and Shatila during the Israel/Lebanon war–a war which the Israeli participants dared remember [or speak of]. In Israel, in response to the massacre at Sabra and Shatila, about four hundred thousand people took to the streets to protest this horror. Menachem Begin, then Israeli Prime Minister rationalized the horror by invoking the million dead Jewish children in Nazi concentration camps. In response to the public outrage, a commission of inquiry was instituted. Sharon was reprimanded [years later he would publicly state his regret for not killing Arafat before he left for Tunis], but there was no talk about a war crime. After his memory came back, Folman delved into the memory of other ex-soldiers of the Lebanon war. The director posted notices on the internet, asking veterans of the war for their stories, their nightmares. He got over a hundred replies, and these he inter-wove with his own memories of horror. 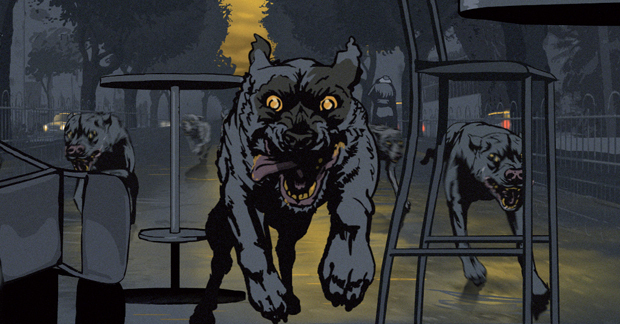 Waltz with Bashir opens with a snarling, racing pack of dogs. The dogs converge outside a Tel Aviv apartment–belonging to a former mate of the director’s. During the war, the mate had been assigned the task of sniping at the dogs guarding the villages before Israeli troops carried out their night raids. And now, night beyond the night, the dogs begin haunting the mate’s dreams. The film’s title refers to the unforgettable moment when an Israeli soldier, pinned down by a sniper from the surrounding buildings, leaps up and starts firing his machine gun, waltzing across a rooftop past pictures of the murdered phalange leader, Bashir Gemayel. There is nothing sensational about Folman’s film. It’s a frank and brutal odyssey through ones lost [and regained] memory. Waltz may seem like a cartoon and move [somewhat slower, though] like one. But it is much more than that. It lacks the whimsical feel traditionally associated with this genre. The star of this film is the director himself, but there is no self-indulgence in this. In many ways, it works for the film. The whole film becomes like the mind’s labyrinth through which we follow the animated director in his quest to come to terms with his own watershed event. Through flashbacks, other friends’ accounts, visits to the psychiatrist we walk through this maze–and not at the film’s almost sleep-wandering pace. In spite of its almost surreal feel, Waltz captures the harsh reality, the extreme brutality of war. And recalls a line from Oswald Mshali’s Nightfall in Soweto: “Man has become beast/Man has become prey.” One could almost feel hidden hearts beating in dread as the murderous phalange [and indeed Sharon’s men] prowls the street, moving from house to house spreading fear [and death] like fine sand. And these hearts are not just Palestinians. “My mother and father were both Holocaust survivors,” Folman said. “My mom talks about it always. My father never does. We all have our own strategies for dealing with tragedy.” Folman’s strategy was to flee into amnesia, to flee his memory–for over 20 years. “I’d never heard my own story. It never left my mouth.” Both my parents were also survivors of war. They had survived the tragedy of the Nigeria/Biafra war. My father’s strategy was to bottle it all up. I never heard his own story [of the war]. It never left his mouth. My mother, however, always talks of it. On a more general level, however, people are encouraged not to talk about the war, to pretend it never happened. People are encouraged to flee their memory, to flee into amnesia. In its terminal sequence, Waltz ends its animation-style narrative and used newsreel footage to show the horror, the carnage that was Sabra and Shatila. “I didn’t want people to walk out thinking this was just another cool anti-war movie,” the director said. “I wanted to remind them that this horrible event really happened, and we Israelis were part of it.” One naturally agrees with this–and not just with regard to the Israeli involvement, not just with Sabra and Shatila. In this regard, Folman’s film stands as an indictment against silly mainstream narratives. A cinema that loses touch with the times, that loses touch with its people losses the confidence of its people and becomes an idle pass-time for people content with sleeping through the deluge that threatens them. We follow Folman–his animated teenage self–through his tortured memory. We see him wander, wraith-like through the streets after his return from war; we see him– dissociated from himself and from his environment–as he watches a rock guitarist on TV; as he watch kids playing a game of death and destruction; and as he watch his ex-girlfriend dancing with another guy. These normal, everyday events–far removed from the horror of Beirut-Lebanon–eerily recalls the horror, how close and yet so distant: “… it was a 20-minute helicopter ride and I was back in Haifa, where the war didn’t exist,” Folman said. We see also how the surreal can become real, or maybe, how the real can become surreal; as Folman watches his ex-girlfriend dancing with another guy, the disco lights strongly recalls the orange flares fired over Sabra and Shatila to light the path of killers.